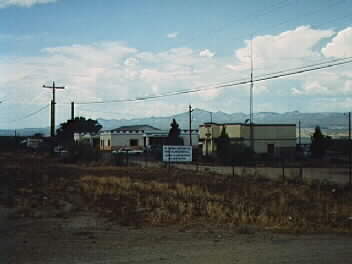 This is a picture of the Apache Police Headquarters located in the small community of Bylas, about 60 miles east of Globe. Bylas truly has a dramatic history. It was to Bylas that John Clum, first Indian Agent of the San Carlos Apache Indian Reservation, moved many White Mountain Apaches in the summer of 1875 as a part of the government's plan to concentrate all Apaches on the San Carlos Reservation. The Apaches at Bylas today are basically descendants of those people. In the late 19th century white people often called these Apaches "Coyotero Apaches," because they were distinct from most of the San Carlos Apaches. Even today the Bylas dialect of Apache is slightly different from that of most of the San Carlos Apaches, but the Bylas people are a part of the San Carlos Reservation. When Geronimo was forced to live on the San Carlos Reservation he spent most of his time near here. The actual spot where his Chiricahuas lived is still called Geronimo today--very near Bylas. Geronimo hated this place because of the heat and disease. Today it is a progressive part of the reservation, but still remembers its legacy with great pride. Grenville Goodwin the famous white anthropologist who worked among the "Western Apache" lived several years at Bylas, and most of his informants came from this proud community. This is another picture of the Bylas area. In the background can be seen famous Mt. Graham. Mt. Graham is the site of the controversy regarding the construction of astronomical telescopes by several astronomical institutions, particularly the University of Arizona in Tucson. Many environmentalists oppose the telescopes, as well as the San Carlos Apaches, who consider the site sacred. 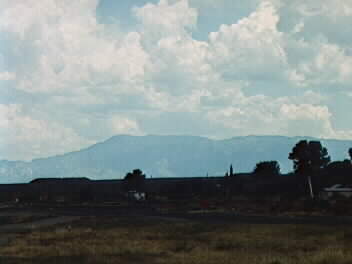 In Apache the mountain is called Dzi£ Nchaa Si'án, which means "Large Mountain." For more about the controversy, see Mt. Graham Controversy Page and Apache Survival Coalition.